The Bright Morning Star quilt block is a simple nine patch featuring only squares, rectangles and flying geese patches. Even though this is an easy quilt block to construct does not mean it is boring. The placement of the fabrics is what gives this block its stunning interest to the onlooker. The quilt featured on the left uses a standard side by side block setting. 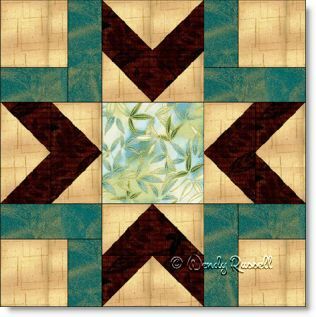 The sashing strips between the blocks add that little "something extra" to the quilt. The quilt which is illustrated on the right uses an on point setting with several blank blocks to showcase your quilting skills.